Periodontal disease is a chronic inflammatory condition of the supporting tissues of the teeth. 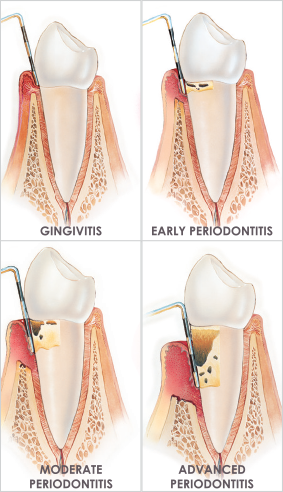 When gingivitis is not treated, it can advance to “periodontitis” (which means “inflammation around the tooth”). With periodontitis, gums pull away from the teeth and form spaces (called “pockets”) that become infected. The body’s immune system fights the bacteria as the plaque spreads and grows below the gum line. Bacterial toxins and the body’s natural response to infection start to break down the bone and connective tissue that hold teeth in place. If not treated, the bones, gums, and tissue that support the teeth are destroyed. The teeth may eventually become loose and have to be removed. Our periodontist who is a specially trained dentist who specializes in evaluating and treating gum disease using both surgical and non-surgical approaches. We offer a variety of treatments including pocket reduction surgery, soft tissue grafting and bone grafting.